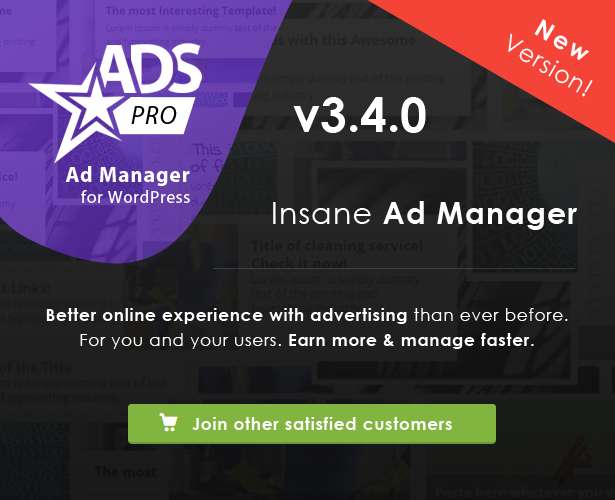 This entry was posted in Advertising and tagged ad, ad manager, ad plugin, ad system, ads, advert, advertising, backend ad manage, buysellads pro, frontend ad, manager, material design, ordering form, wordpress ad, wordpress ad manager on August 22, 2015 by Vera Jaman. Please join our newsletter on the AdPress website to stay informed about updates and news relating to the plugin development. 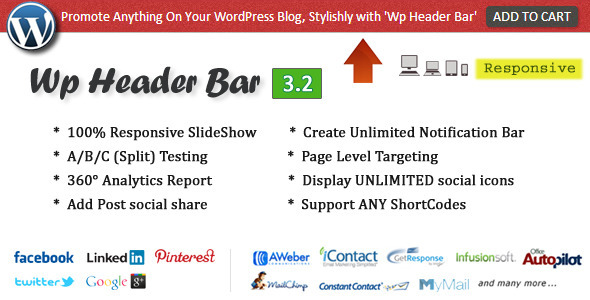 Integrating your Ad Zone in your blog is quite simple. 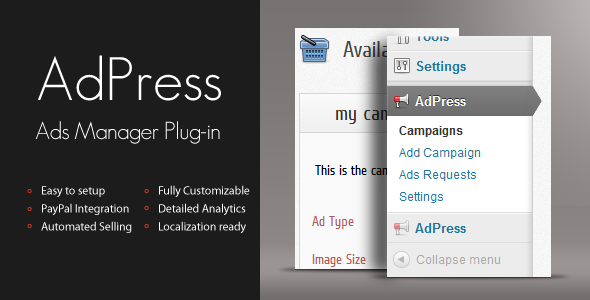 AdPress has widget, shortcode and function support. 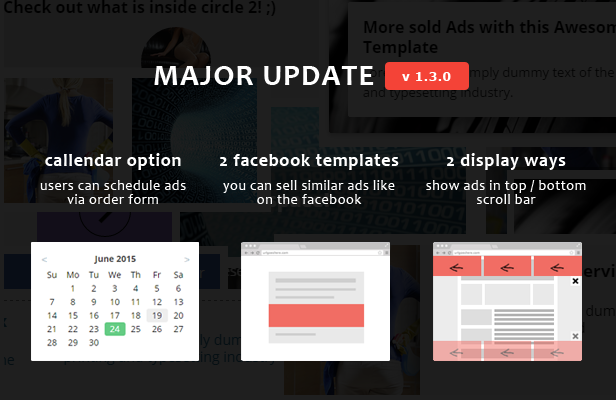 Users sign-up and purchase Ad Spots from their profile dashboard. Payment is automatically handled with PayPal. 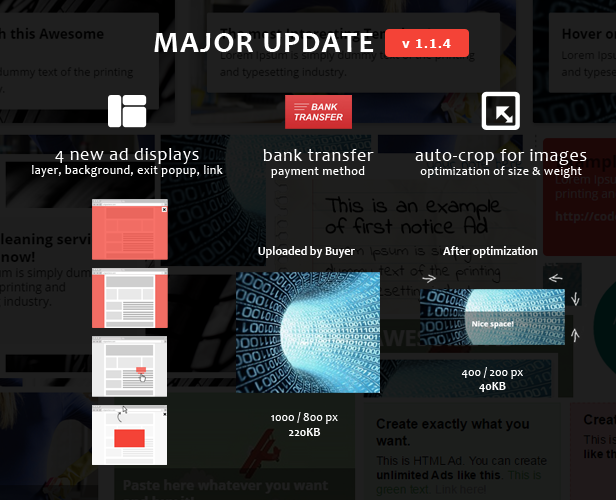 When a user make a purchase, you are notified in your dashboard, and you can accept or reject their Ad. PayPal refunds are supported too. 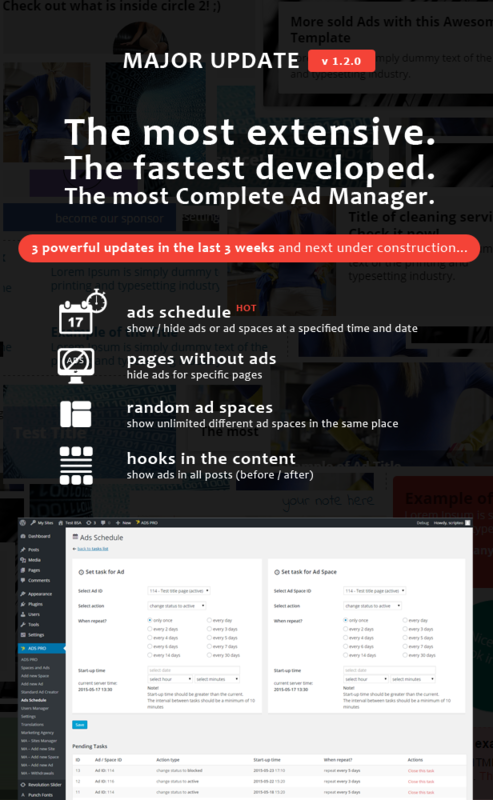 Ad Stats are accessible for both the Admin and the client who purchased the Ad. AdPress provide detailed statistics with CTR, Averages and a nice chart. AdPress records the history of purchases of each Ad. 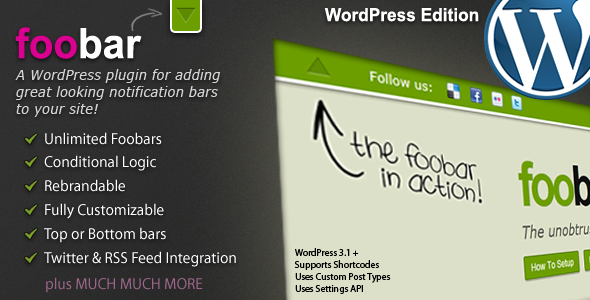 It also has a powerful Import and Export feature which back-up all or a portion of your data to a back-up file. 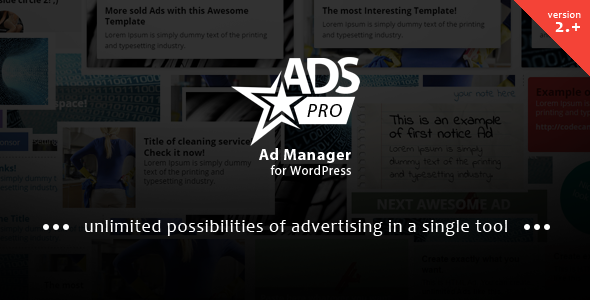 AdPress Ads can be fully customized. 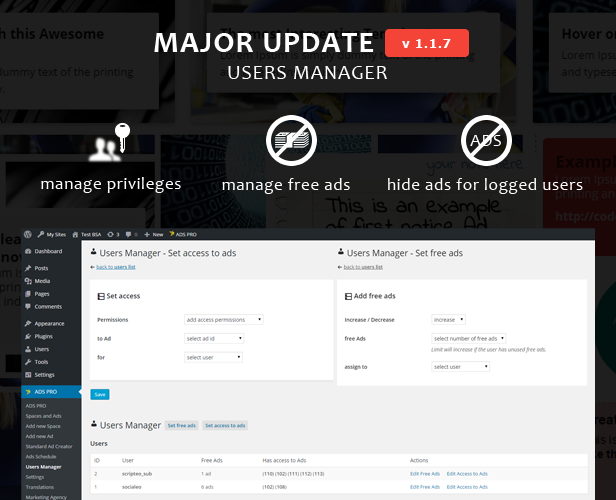 The generated HTML and CSS code for the Ads can be changed from the settings panel. AdPress comes with a very detailed help file. 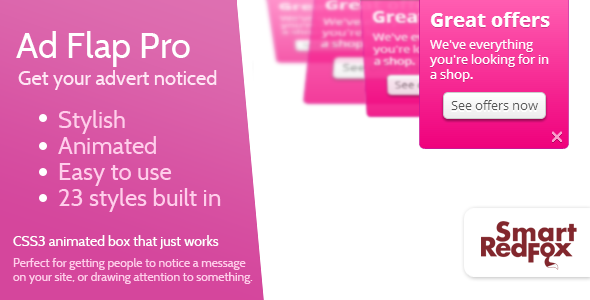 We also offer a very fast support (forum+emails). Expect a response from us in 24/48hours. The PayPal Express gateway integration for AdPress allows users to select PayPal as their preferred payment method. Since the checkout process does not occur on your website, anSSL CERTIFICATE is not required and you don’t have to stress over PCI compliance. 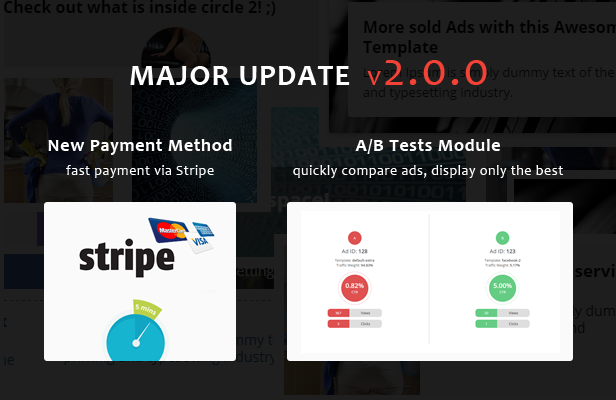 Stripe gateway integration for AdPress allows users to select Stripe as their preferred payment method. Since the checkout process does not occur on your website (Stripe Checkout Popup), anSSL CERTIFICATE is not required and you don’t have to stress over PCI compliance. 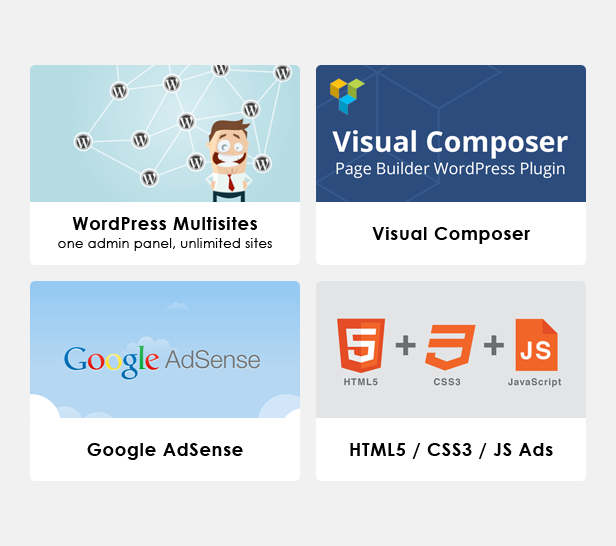 This entry was posted in Advertising and tagged ad manager, adpress, ads, ads management, ads manager, advertising, manager, paypal, sales, wordpress on May 8, 2015 by Vera Jaman. This entry was posted in Advertising and tagged alert, bar, foobar, jquery, notifaction, plugin, rss, twitter, wordpress on April 2, 2015 by Vera Jaman.